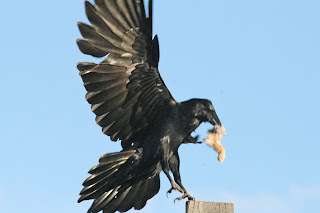 In the top two pics this Common Raven, who is being harassed by the second raven in hopes it will drop it's rabbit, jumps up (with rabbit safely in it's beak)then lands again to feed a little more--and providing nice views of the underside of it's wings and tail. 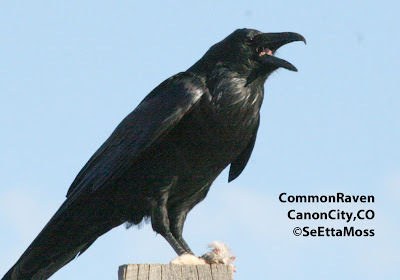 This is one of two Common Ravens I enjoyed watching this week in Canon City, CO. 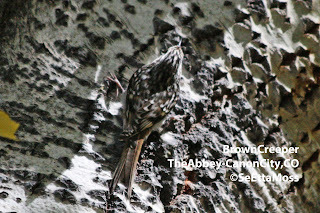 In the top pic the raven has a beak full of rabbit, with the rest of the bounty secured by it's feet. 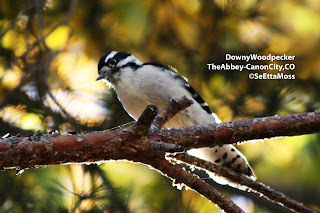 I found this male Downy Woodpecker working hard on one tree after another on the grounds of The Abbey in Canon City,CO. 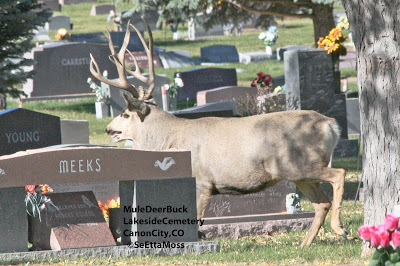 While I was watching the two male Williamson's Sapsuckers chase each other around the Lakeside Cemetery in Canon City, CO, I got another surprise when the very big buck in these pics showed up. 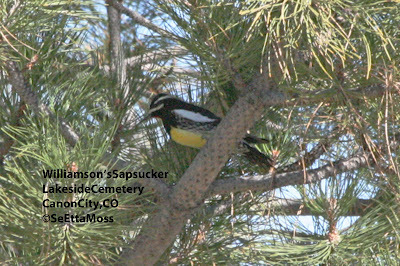 Though Lakeside Cemetery is on the edge of Canon City, it is bordered on the north side by H115 which is busy all day. 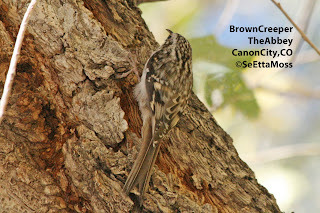 I suspect he ran across traffic as he was already in a panic to get out of town when I first spotted him. It is not only unusual to see such a large buck with this big rack here but he is a Mule Deer and I usually see White-tailed Deer in town.